You clamored, I heard. 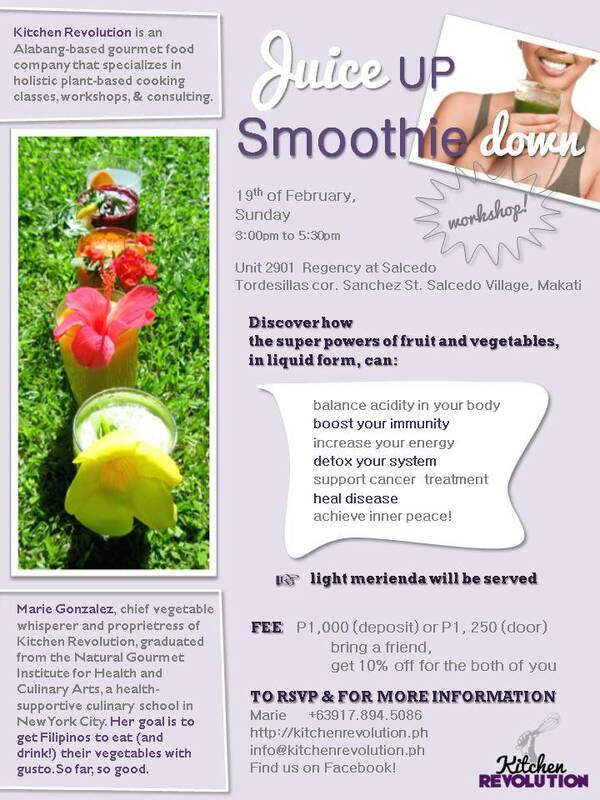 I’m bringing the green juice and smoothie bandwagon Makati-side on the 3rd Sunday in February – check it out! Why juice, why smoothie? What’s in it for you? Well, one of the easiest ways to eat more veggies without really thinking about it is to drink them. In this workshop, learn how juices and smoothies made from fresh fruit and vegetables can help you feel and look amazing! Discover how to concoct cocktails to increase energy, cleanse the liver, boost immunity, pump up the iron reserves in the body, and fight the onset of flu and colds. You’ll also learn how to make yummy green smoothies (!!) that are good for you and are seriously addicting. Your kidney, liver, colon, immune system, and blood will thank you. I said it before, I’ll say it again – the solution to life’s problems, tears, sicknesses, and hangovers is green juice and smoothies. Come to the workshop and find out more. I promise, it’ll be worth your while. 19th of February, a Sunday afternoon – put down that deadly ensaymada and spend your merienda time with greens + me! I’ve conducted this workshop a few times in Alabang, St. Luke’s Medical Center in Quezon City, and Cebu. If you suffer from vegetable-phobia, let me guide you gently to the dark (leafy green) side. RSVP is required. Workshop fee is discounted if you pay in advance and / or you bring a friend. Check out the poster for more details. You may make advanced payments via deposit at BPI Savings savings account # 3529-0762-65 (under the name MARIE THERESA I. GONZALEZ). hi marie, i would like to attend this workshop. the picture is kinda blurred, would you let me know how to RSVP? Great! Click on the image and it will be zoom-able. To RSVP, send me a text at 0917-894-5086 or email so everything’s ‘in paper’. If you’d like the discounted fee, make a bank deposit to BPI Savings savings account # 3529-0762-65 (under the name MARIE THERESA I. GONZALEZ). If you bring a friend, get 10% off for the both of you! Let me know when you’ve made the bank deposit so I may verify online. Either fax me the deposit slip (8509494) or bring it with you on the workshop date.